Chris Alldredge, 21, was practicing for the Monster Energy AMA Supercross event at CenturyLink Field when he landed on a dirt ramp and crashed his bike. The rider directly behind him was not able to stop in time and slammed into Alldredge as he lay on the ground. The accident happened in front of an audience that had gathered at CenturyLink Field to watch the weekend events. Alldredge suffered severe injuries including a broken rib, a fractured pelvis, a collapsed lung, a lacerated liver and adrenal gland, a fractured rib, and multiple fractures in his spine. He was taken to Harborview Medical Center for emergency treatment of these injuries. 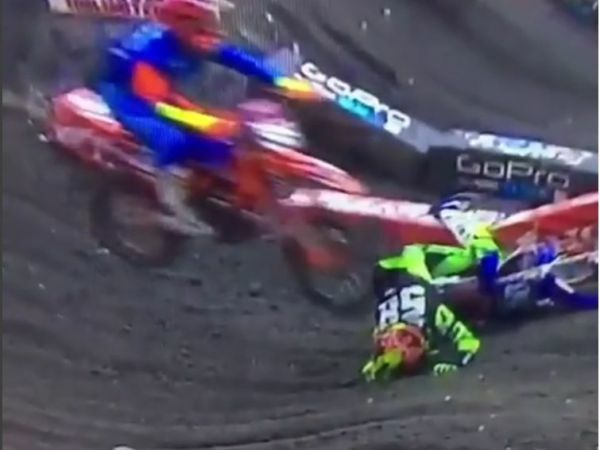 In an Instagram post, Alldredge shared a video of the crash and stated that he did not consider the other bike rider responsible for his injuries. “I'm sorry for wrecking where I did and leaving you no outs. Hope you're doing alright man,” he wrote, before congratulating the man on his 5th place finish. He also asked readers to send well wishes to another friend in the motocross world who had recently suffered a severe spinal fracture. Motocross riders are adults, and they’re allowed to make their own decisions about the risks they’re willing to take for their sport. It’s commonly acknowledged that motocross is unusually dangerous, even for an extreme sport; riders must make high jumps on a small bike at fast speeds, land precisely, and avoid colliding with other bikers. Scientists are also studying the long-term effects of more subtle, non-paralyzing injuries. Over time, athletes who suffer a series of small concussions are at risk of developing a degenerative disease called chronic traumatic encephalopathy, or CTE. Unlike more immediate forms of head trauma, CTE doesn’t show up on brain scans; it can only be diagnoses in a post-mortem autopsy. In recent years, extreme sports athletes involved in BMX, downhill skateboarding, and in-line skating have been posthumously diagnosed with CTE after they took their own lives. Depression, difficulty concentrating, difficulty with impulse control, and suicidal tendencies can be symptoms of severe CTE. Scientists hope that it may someday be possible to definitively diagnose and treat CTE in a living patient, slowing or stopping the disease’s progress. Safety equipment manufacturers are also looking into better head and neck protection that can absorb the crushing impact of a direct blow to the head and prevent the “whiplash” motion of the head violently moving forward and backward. If you have been injured in a motorcycle accident, contact Davis Law Group.